BOSTON -- Victims of a 2012 meningitis outbreak caused by a now-closed Massachusetts compounding pharmacy will have access to a $200 million compensation fund, following approval Tuesday by a federal bankruptcy judge. The new fund will be available to compensate creditors and victims who became ill or died as the result of receiving tainted steroid injections from the New England Compounding Center. It is part of a plan to liquidate the assets of the Framingham-based center approved by U.S. Bankruptcy Court Judge Henry Boroff. "This is really the end process of the bankruptcy case, barring any appeals," said David Molton, a New York lawyer representing creditors. "It starts a new phase in which the architecture and the structures we built in order to get money to victims will start their machinery." The 2012 fungal meningitis outbreak killed 64 people and sickened over 750. People in 20 states were affected; Indiana, Michigan, and Tennessee were the hardest hit. About half developed a rare fungal form of meningitis. The rest suffered joint or spinal infections. Molton said the judge is expected to finalize the plan in the coming days and victims should begin receiving payments before the end of the year. Roughly 3,300 victims are qualified to seek compensation from the fund, he said. Those most seriously impacted - such as the families of those killed by the tainted drugs - will "no doubt" receive the largest payments, he said, declining to elaborate. "Victims can never be compensated adequately for the suffering inflicted on them by (the center), but this case does demonstrate how the law, and particularly bankruptcy law, can be used to bring some justice to people seriously injured by a company's misconduct," Molton said. 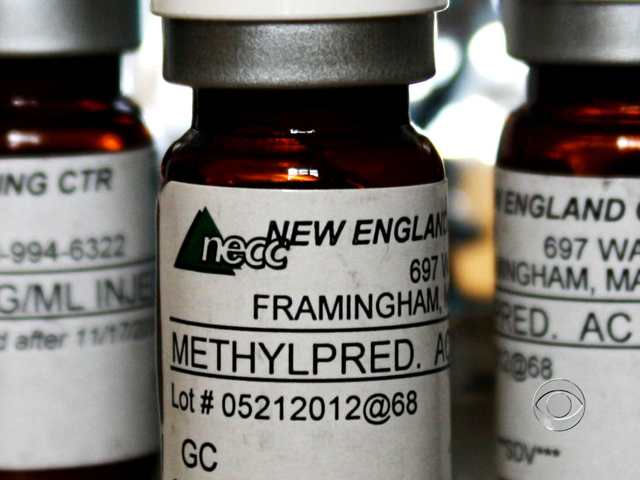 A CBS "60 Minutes" investigation in 2013 found that the New England Compounding Center was manufacturing large quantities of steroids without FDA approval, rather than preparing individual prescriptions. A whistleblower who worked at the center said mold was repeatedly found in the "clean room," a supposedly sterile environment where drugs were prepared. The victim's fund is being paid through settlements with the New England Compounding Center's shareholders, clinics and health care providers that administered its drugs and companies that had business relationships with it. The bankruptcy plan's approval comes as 14 former employees of the New England Compounding Center, including its founders and majority shareholders, face federal racketeering charges in what authorities say is the largest U.S. criminal case ever brought over contaminated medicine. Center employees are accused of using expired ingredients and failing to follow cleanliness standards, resulting in tainted steroid injections. The outbreak prompted new federal and state laws to better regulate compounding pharmacies, which custom-mix medications in bulk and supply them directly to hospitals and doctors.